The Museum has a large amount of Transmission and Distribution apparatus, some installed in our garden area, some inside the building and some in storage. A selection of interesting items follow. The Gravesend Feeder Pillar as it looks today. Built by the American owned “Western Electric Co. London” our pillar was installed at Gravesend, outside of the “Old Prince of Orange” public-house, at the junction of Old Road West and Windmill Street, as an electricity feeder pillar for the tramway extension along Windmill Road. It first entered service in 1903 and supplied direct current electricity to the tramway until the cessation of the tram service in 1929. Subsequently, the pillar was converted into a street lighting feeder pillar, to supply street lights in Old Road East, Devonshire Road, Windmill Street and Old Road West. 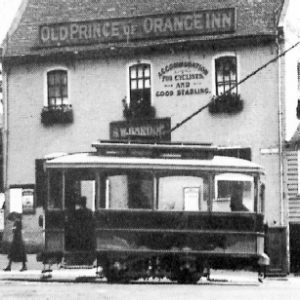 Still supplying direct current, it would have been converted to alternating current when, or before, the last DC subscriber (in Gravesend) was converted to AC in 1966. Ultimately decommissioned around 1993/1994, the pillar stood on the pavement until being finally removed in the early twenty-first century, for safe keeping. Arriving at Amberley Museum on the 16th July 2013, it is now installed in the “Electricity Garden”. ● The pillar is constructed from cast iron and contains a wooden framework and a slate mounting board. ● The external dimensions are; Height above ground – 6ft (exc. finial), Width – 2ft 4in and Depth – 1ft 6in. 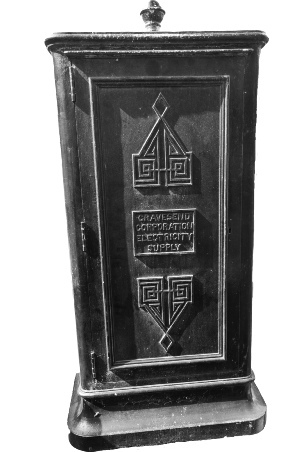 ● The “Gravesend Corporation Electricity Supply” label is bolted onto the front and rear doors, possibly to replace an earlier label advertising the Gravesend and Northfleet Electric Tramways Company. ● Internally there is a group of two capacitors and a choke, possibly a spark quench circuit and possibly dating from its use as a tramway feeder pillar. ● A time-clock is fitted, almost certainly subsequent to the cabinet’s conversion to a lighting feeder pillar and probably installed when the local power station closed, as previously the power station would have been likely to control operation of the lighting system. ● In 1948, when the Electricity Supply companies were taken into public ownership, Gravesend Corporation retained ownership of the street lighting system. 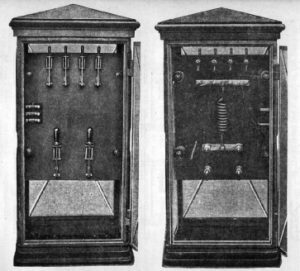 A meter fitted into the cabinet may have monitored the use of electricity by the Corporation. The cabinet in its final use would likely have fed a smaller number of lamps than the existing wiring indicates. The lamps were connected in groups, providing the facility to maintain some lighting supplies in case of repairs being needed to any one circuit. A composite view of our feeder pillar in-situ, partially obscured at the rear of the tram. The pillar is at the bottom right of the picture. 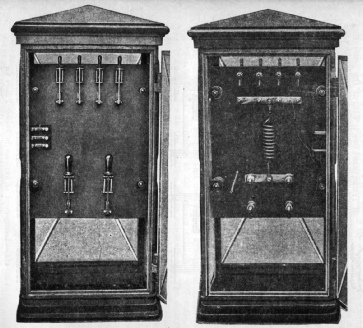 The pictures show the interior of the cabinet as it may have looked when in service as a Tramway Feeder or Section Pillar. Typically these pillars were situated at each end of the route and also at every half mile. They controlled the connection of the sections of the trolley wires, one to another and also from the supply.